This updated chart of the total number of liberal democracies is from Robert Prechter's book, The Wave Principle of Human Social Behavior, which observed that bull markets "tend to lead to political freedom, while retrenchments lead to political repression." Various measures of democracy yield different totals, but the consensus tends to show that democracy started to spread at the beginning of the Supercycle wave III in 1842. The basic pattern is shown on the chart from WPHSB, which is constructed with data from The End of History by Francis Fukuyama as well as data from Freedom House, a democratic watchdog organization, beginning in 1973. In a 1991 paper, "Democracy's Third Wave," social scientist Samuel Huntington states that the "first 'long' wave of democratization began in the 1820s and continued until 1926, bringing into being some 29 democracies." A "reverse wave" into the mid-1940s, reduced the number of democratic states to 12. Most of this period constituted a Supercycle-degree bear market in inflation adjusted terms. After another wave of democratization carried into the 1960s, "a second reverse wave brought the number of democracies back down to 30." A third wave toward democratization began in 1975, which matches well with the bull market, as it was the first year of Cycle wave V in stocks (in nominal terms). So, the trend toward democracy tracks the trend in the stock market remarkably well. The reason is that social mood is in charge of both trends. Underneath the surface, Freedom House's data show that democracy is losing ground. After years of gains, the number of countries showing improvement in political rights and civil liberties is below those showing declines in similar measures, and it has been since 2006. The end of the Cold War ushered in an era of expanding freedom. Is the golden age of democratic transitions drawing to a close? What is the state of democracy in the world today? Though few of the democratic gains of the past have been decisively reversed, the last few years have been a discouraging period for democracy, and 2014 presents particular cause for alarm. Russia's annexation of Crimea and support for separatism in other parts of Ukraine highlight a trend toward the resurgence of authoritarian powers and a new willingness on their part to employ military and other means to counter democracy. The new assertiveness of the authoritarians can be seen in the conflicts in Syria and Iraq and in China's actions in the South China Sea, as well as a variety of other arenas in which they are pursuing policies aimed at the "containment of democracy." There is reason to suspect that what we have been calling the post-Cold War period has come to a close. The chances are that the years ahead will witness greater international instability than the world had seen for the past several decades. Subscribers to our sister-publication, The Socionomist, read about the trend toward authoritarianism back in 2010, as well as in the March, April and May issues this year. Socionomists are ahead of trends because we know their cause. Now, finally the trend-watchers can see what's happening because, as they say, the writing is on the wall. It probably won't be too long before the walls are literal. 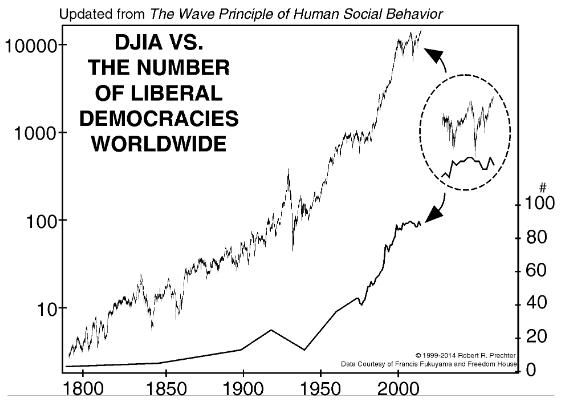 This article was syndicated by Elliott Wave International and was originally published under the headline The Democracy Wave Recedes: Does this Chart Show a Developing Bear Market for Liberal Democracy?. EWI is the world's largest market forecasting firm. Its staff of full-time analysts led by Chartered Market Technician Robert Prechter provides 24-hour-a-day market analysis to institutional and private investors around the world.